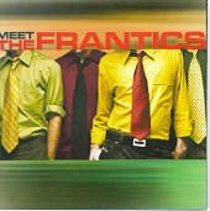 The Frantics high-energy pop/rock displayed on their Organic Records debut, Meet The Frantics, has its roots in the loose, fun sounds of early 80's bands like The Knack and Cheap Trick. At the same time, Meet The Frantics carries the mark of smart modern music, sitting comfortably next to artists such as Foo Fighters and Switchfoot.The Kentucky-based quartet combines their edgy, guitar-based music with lyrics that are laced with humor and faith. From the tongue-in-cheek "Top 40", and the song "Kids of Summer", to the more serious takes on life and faith in "Be There" and "Everybody", Meet The Frantics is fresh, fun and.......well, frantic.